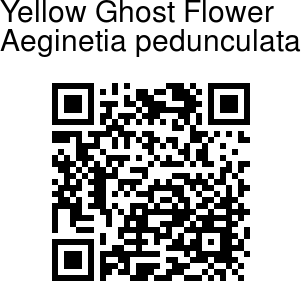 Yellow Ghost Flower is a yellowish to reddish-brown fleshy herb, up to 15 cm tall. Flower-cluster-stalk is 2-10 cm long. Calyx is 3-5 cm long, pinkish to whitish. 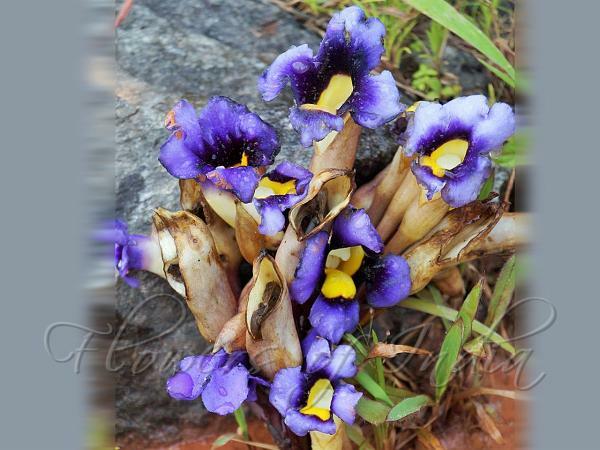 Flowers are 6-7.5 cm long, about 5 cm wide at the mouth, yellowish to white with violet or bluish petals, rounded toothed or erose at the margins; tube about as long as the calyx. Capsule is ovoid, about 2 cm in diameter, apiculate with a persistent style-base; seeds very small, brownish. Yellow Ghost Flower is found in Indo-Malesia. Flowering: September-November.